THURSDAY, Aug. 16, 2018 (HealthDay News) — Your eyes could provide early evidence that you’re developing Parkinson’s disease, a small study out of South Korea suggests. People with early Parkinson’s appear to experience a thinning of their retinas, which are the light-sensitive nerve cells that line the back of the eye, the researchers reported. This study is the first to specifically link retinal thinning to the loss of brain cells that produce dopamine, the chemical neurotransmitter at the heart of the degenerative disease, said lead researcher Dr. Jee-Young Lee. Lee is a neurologist with the Seoul Metropolitan Government — Seoul National University Boramae Medical Center. “We also found the thinner the retina, the greater the severity of disease,” Lee said in a news release from the journal Neurology, which published the study online Aug. 15. “These discoveries may mean that neurologists may eventually be able to use a simple eye scan to detect Parkinson’s disease in its earliest stages, before problems with movement begin,” Lee added. Parkinson’s has no definitive cause, but symptoms suffered by patients have been linked to a breakdown of neurons in the brain that produce dopamine, according to the Parkinson’s Foundation. Parkinson’s is known for its incurable and progressive effects on a person’s motion. Patients suffer from tremors, rigid limbs, slow movement, and problems with balance and walking. Less well-known are vision problems that can occur in Parkinson’s patients. The loss of dopamine neurons in the retina can dampen the eye’s ability to process and perceive color, while motor symptoms can make it difficult to move or focus the eyes. A 2017 study in the journal Radiology reported that such changes in vision could be an early sign of Parkinson’s disease, preceding the appearance of motor disabilities by more than a decade. To further examine this potential early clue, Lee and colleagues studied 49 people, average age 69, who’d been diagnosed with Parkinson’s disease a couple of years earlier, but had not started any medication. The participants were given a complete eye exam, as well as a high-resolution eye scan that uses light waves to capture images of each of the retina’s five layers. In addition, 28 of the patients also underwent brain scans to measure the density of dopamine-producing cells in the brain. Significant retinal thinning had occurred in the Parkinson’s patients, compared with a control group of 54 healthy age-matched people, the researchers found. This thinning occurred most notably in the two inner layers of the retina. For example, the inner-most layer of the retina in one section of the eye had an average thickness of 35 micrometers in Parkinson’s patients, compared to an average thickness of 37 micrometers for those without the disease. The thinning of the retina corresponded with the loss of dopamine-producing brain cells, and with the severity of the patient’s disease. 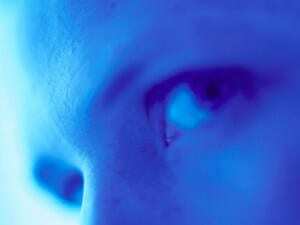 People with thinner retinas had the most motor disability, the findings showed. However, both Lee and Di Rocco said the study was too small to provide definitive proof. Larger studies will be needed to confirm the finding and determine why retinal thinning and the loss of dopamine-producing cells are linked. The American Parkinson Disease Association has more about Parkinson’s effects on vision.